Modern IT is a balancing act between integrating new technologies that drive business innovation and ensuring existing technologies are running smoothly. In the wake of digital transformation, however, it’s important that IT organizations are able to distinguish themselves as value creators first and foremost, rather than cost centers. Ask yourself; is IT doing everything it can to identify as a value-add to the business? 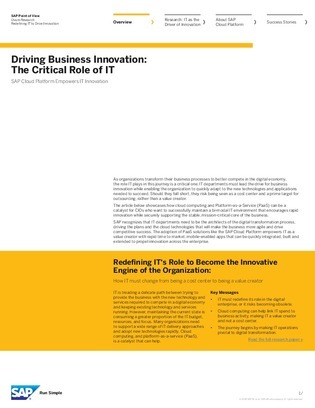 Click to learn more, and get actionable insight into how your IT can take charge and lead innovation.